What's this?, originally uploaded by Camemberu. Does this look like an alien lifepod containing the spawn of unknown beings about to hatch? The egg splits open!, originally uploaded by Camemberu. Arggh! It's open! It's alive! No, wait, it's not. It's just a "QQ High Iron rice ball". 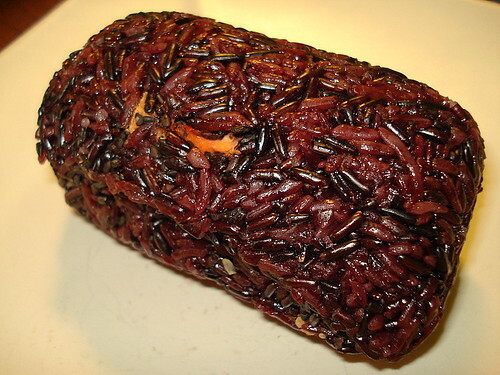 The purple beady stuff is black glutinous rice. The filling includes tandoori chicken (looks like it's gotten imprints from the black sesame seeds), crispy yellow bean bits, meat floss, dried shrimp and whatnot. The rice had a "QQ" (al dente?) crunchy chew to it (despite being eaten only after a five-hour delay) and the fillings came together well, flavourwise. But I can imagine hubby not liking it at all. QQ Rice Ball, originally uploaded by Camemberu. 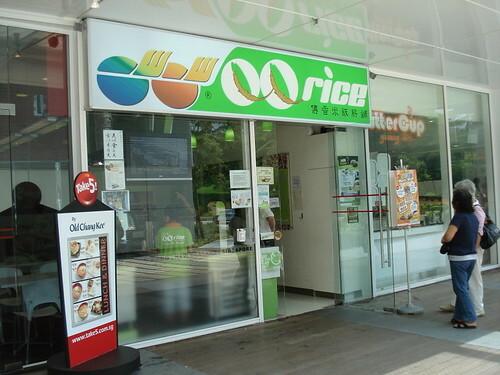 QQ Rice Ball is a tiny shop at Square 2 Novena offering what's been dubbed the "Asian" Subway - rice-based 'sandwich' or ball encasing fillings of your choice. Looks like a Taiwanese import (official website is in Chinese). Ordering process, originally uploaded by Camemberu. Here's how you order your rice ball and I am reminded of this Buddhist saying, "Where there is choice, there is suffering!" - how true that rings here! 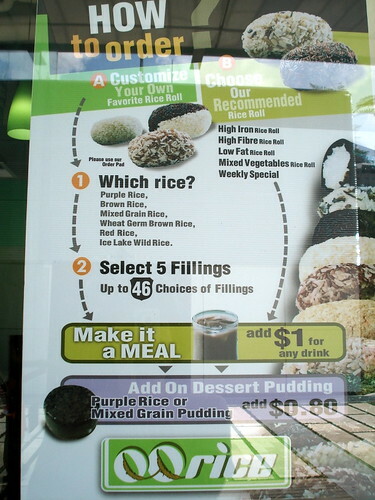 Pick from six types of rice (S$3.20-$3.90) and five out of 46 fillings (meats, seafood, vegetables) to go with it. Oh my, what to choose? Will this ingredient go with that? What will a combination of rendang mutton, shrimp paste, sliced burdock, stewed pot egg, pickled cabbage and turkey bacon taste like?? I guess the mystery and how things can go right/wrong is all part of the fun. Fortunately, there are also a few recommended combos if you can't make up your mind. 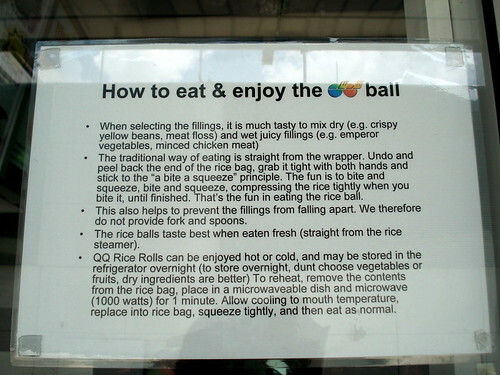 How to Enjoy Your QQ Rice Ball, originally uploaded by Camemberu. Later on I realised why the QQ ball tasted so good - ants swarmed my empty plate in less than an hour - the rice must have had a lot of sugar in it. Well, interesting concept but I still prefer Japanese rice balls - onigiri! Now if only someone will come and set up a proper onigiri shop in Singapore! 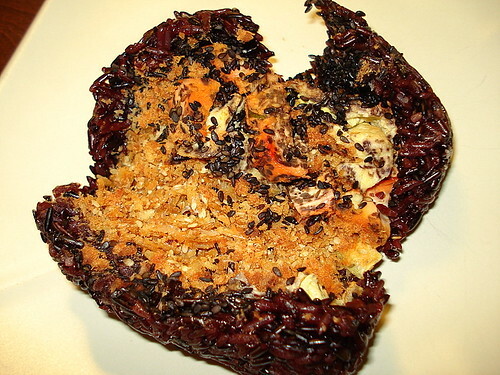 A new outlet is slated to open at #B2-34 Plaza Singapura in August 2007.
omg the photo of the rice is like cockroach egg smashed. yucks. LOL meepoker! You are right! It does look like cockroach eggs (no wonder I thought of alien eggs). 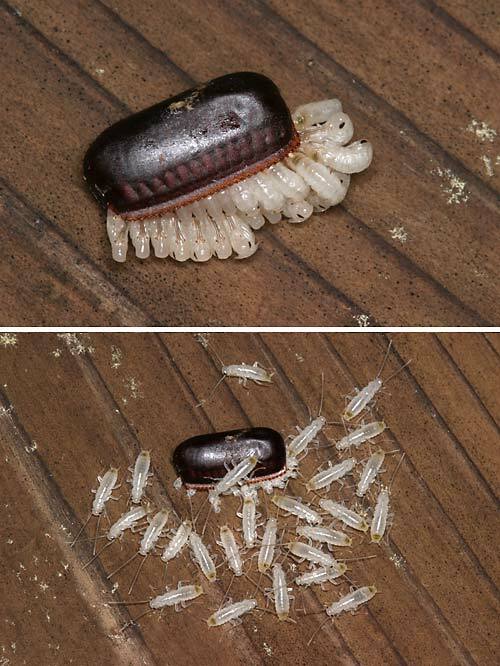 But here's what a cockroach egg hatching really looks like. Wow, thanks for the MSG tip, anon! While I have no intolerance towards MSG (in fact, I even like it a bit), I don't really have compelling urges to go back and eat a QQ ball. Nice for the novelty factor but I think it's too much of a carbo rush.